Surprise package arrived last week! The brand new SampleStore.com packaging so sweet and lovely! It’s the NEW Hada Labo Hydrating Light Lotion! Hada Labo Bestselling Hydrating Lotion in Japan and Singapore!! 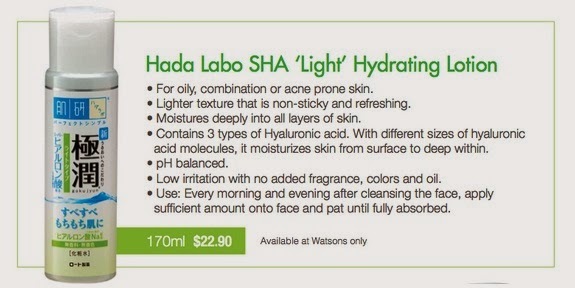 Now Hada Labo has released the Hydrating Light Lotion! NEW Hada Labo Hydrating Light Lotion is perfect for oily and combination skin like me, or those who prefer a lighter texture. Pour appropriate amount on palms, spread evenly and gently pat the lotion onto face until thoroughly absorbed. Non-sticky feeling after applied. Fragrance free, no mineral oil, alcohol and colorant, very gentle to skin. Hydrating Light Lotion able to hydrates & moisturise my skin and gives a refreshing feel! Hada Labo Lotion is my all-time favourite lotion/toner for my skin!